Cricket - Elland v Barkisland. Barkisland bowler Darren Robinson. Barkisland captain Darren Robinson had an excellent match as his side continued their improvement in the Huddersfield League’s Championship with a seven-run home win over Slaithwaite. Robinson must have been fearing the worst when his departure for 41 left Barkisland 117-7 but Aussie Sam Moyle hit 50 not out off 43 balls and wicketkeeper Phil Akroyd 31 not out to lift the total to 205-7. Slaithwaite were in control at 123-1 but Robinson had opener Hasnat Yousaf caught behind and ran through the rest of the visiting batting line-up to finish with seven for 52 and give his side a narrow victory. Rastrick look to be mounting another promotion challenge after last season’s near miss. They had little difficulty in notching a seven-wicket win over visitors Holmfirth, who only reached 118 thanks to a patient unbeaten 37 from their number five Amar Rashid. Jack Pearson (3-37 off 15) led a tight display from the home attack. Rastrick knocked off the runs inside 19 overs with openers Ovais Hussain (35) and Majid Khan (37) leading the way and the Rounmd Hill men share the lead with Almondbury Wesleyans. Elland lost by four wickets at Clayton West in a game of fluctuating fortunes. The Hullen Edge side were soon 20-3 but the Paul Winrow hit 72 off 78 balls and Jack Hendy an unbeaten 52 off just 34 to help the visitors post a healthy 229-6. It was then the turn of the early Clayton West batsmen to struggle. The hosts were 12-3 but Philip Tunnicliffe proved their match-winner with 128 not out, including 10 sixes, to seal victory with 9.1 overs to spare. Lightcliffe will make the short trip to Woodlands on Bank Holiday Monday looking for a fourth win on the bounce in the Bradford League’s top flight. Matt Baxter’s side eased to a seven-wicket win over Cleckheaton at Wakefield Road yesterday. It was slow going for the visitors, who were without Yorkshire’s Tom Kohler-Cadmore and laboured to 120 all out in the 46th over. Yassir Abbas (3-39) and Suleman Khan (3-11) were the most successful bowlers as Lightcliffe applied a stranglehold in the field. An opening stand of 74 between Josh Wheatley (37) and Alex Stead (36) ensured that there was to be no fightback from the visitors and Lightcliffe climbed to sixth. Brighouse followed up their cup win at Spen Victoria the previous Sunday with an emphatic 91-run home win over Carlton in Championship 2. Success was based on a fine batting display. Pro Deron Greaves set the tone with a quick fire 42 alongside opening partner Chris Wynd (46). Sohail Hussain made an unbeaten 84 off 99 balls and Amrik Singh continued his good form with 57 as Brighouse piled up 278 for seven. Greaves followed up with 4-39 as Carlton made 187 in reply with opener Daniel White (37) and No 6 Armad Hussain (33) giving the home attack most to think about. Northowram Fields slipped to the bottom of the table after their four-wicket defeat by Altofts in their first home game of the season. Lacking skipper John Lister, player-coach AJ Weerappuli and the previous weekend’s century-maker Louis Cockburn, they struggled to 153. Dru Patel was run out one short of a half-century and Josh Bennett hit 22 not out off nine balls at the end. Altofts’ new recruit Craig Wood followed up his 3-30 with a match-winning 85. The opener was dropped low down at slip early in his innings but was otherwise untroubled, three of his teammates falling to Bennett who was bowling off a short run due to a football injury. 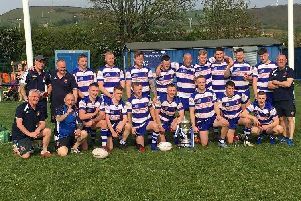 Todmorden are through to the quarter finals of the Lancashire League’s Worsley Cup but Walsden are out. Tod won by 10 runs at Rochdale after Ben Sutcliffe’s 63 had helped them to 193-8. Sutcliffe added 60 with Ben Pearson (39) and pro Chris Schofield (24), Kristian Garland (22), Bilal Abbas (18) and Freddie Priestley (13) also chipped in. Rochdale were all out for 183 in reply with Hamza Ali taking 4-43, including the wickets of pro Ed Moore for 61 and Tom Avery for 37. Matt Collins’ 3-31 also helped tip the scales the visitors’ way. Walsden suffered their first defeat of the season at Darwen, whose total of 290-4 proved beyond them with Jordan Clarke (95) and pro Calvin Savage (77) among the runs.